Rob Kelso is a career civil servant, serving 37 years at NASA’s Johnson Space Center (JSC), formerly holding a position as the NASA Shuttle Flight Director at NASA’s famed Mission Control Center. 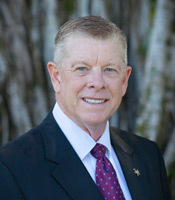 Since November 2012, Kelso has served as the Executive Director at the Pacific International Space Center for Exploration Systems (PISCES). Kelso’s career in flight operations spans 21 years, beginning in April of 1981 as a flight controller on STS-1. In February of 1988, Kelso was selected to the Flight Director “Class of 1988” following the Challenger disaster, which took the life of Hawaii’s Ellison Onizuka. He directed 25 Space Shuttle missions during the 1980s and 1990s. During his time in Flight Control, Kelso was instrumental in launching Department of Defense (DoD) spacecraft aboard the Space Shuttle, beginning with overseeing the first DoD launch from Mission Control while Ellison Onizuka served as the Astronaut in the Shuttle cockpit in January 1985 for STS-51C. He also served as NASA’s Mission Director, responsible for the launch and delivery of the Chandra X-Ray telescope, the last of the great NASA observatories sent into space by NASA. After leaving the Flight Director Office at NASA JSC, Kelso served on JSC’s senior staff as Deputy Director for Safety and Mission Assurance, responsible for directing safety and quality activities supporting manned space flight. One of Kelso’s last roles at NASA was leading efforts to preserve and protect the Apollo lunar landing sites on the Moon. Kelso has been the recipient of the NASA Outstanding Leaderships Medal, and NASA Exceptional Service Medal. He holds a Bachelor’s Degree in physics, and a Master’s in Business Administration.